The activities of political stakeholders in Nigeria, whether before, during and after elections often attract huge discourse among social commentators, both in the conventional and new media. Events in the present political dispensation as it affects the ruling All Progressives Congress, APC at the National level and the main opposition Peoples Democratic Party, PDP, leaves one to wonder if genuine political parties with laid down philosophy really exists in Nigeria. The concept of anti party activity (ies) which leaders of political parties in the country give as reason for disciplining erring members is indeed a ruse, particularly when one takes a critical look at the brazen disregard elected representatives display towards their party leaders. 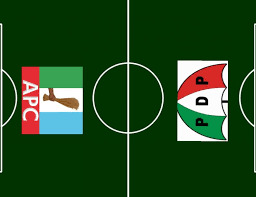 Evidences abound that some members of the National Assembly elected on the platform of APC (including Principal Officers of the legislature) hobnob with members of the opposition PDP against the dictates of their party leadership and even openly show more loyalty to their political friends outside their party compared to the direction their political party wishes. The manner in which the leadership of both chambers of the current National Assembly emerged remains fresh in our memory. To put it simply, both the APC and PDP as at today lack clear leadership, because most of the elected political class don’t believe in the ideology on which their political party were founded. Little wonder, political elites defect from one party to the other in such shameless manner and it’s therefore no surprise the ruling APC is yet to hold National Convention despite holding power at the National level for approximately two years now. There is no need dwelling much in the PDP, because it’s clearly a shattered house without any clear leader, no thanks also to alleged infiltration by APC hawks. As the April 26, 2017 Bye-Election for Warri South Constituency 1 draws nearer, the political intrigues building up to the poll loudly, attests to the fact that Nigeria don’t have political parties, but political associations, hence no need to talk of anti party activities. This is because political gladiators in Warri South Constituency 1 claiming to be PDP leaders are guilty of anti party activity like their counterparts across the country. How else can one explain the fact that those who call themselves PDP leaders in Warri South Local Government Area, Delta State, backed someone who contested on SDP platform in 2015 against a PDP candidate in the House of Assembly election and they have taken their action further by fielding a candidate on the platform of Accord Party in the forthcoming April 26, 2017 Bye-Election, whereas they claim to be founding members of PDP! The apparent fracture in APC in Warri South Local Government Area which has further widened in the build-up to the Bye-Election, only leaves one to conclude that Nigeria’s political space is saturated by self-seeking and egoistic people who deal with possible internal threat under the guise of anti party activity, whereas what exists in the country are political associations and not political parties.